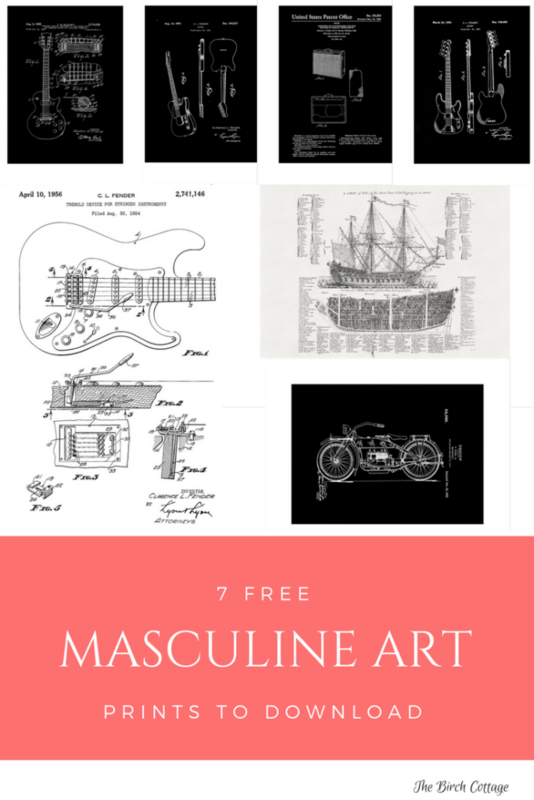 In celebration of our son Phil’s birthday today, I thought I’d share these free masculine art prints to download and print. 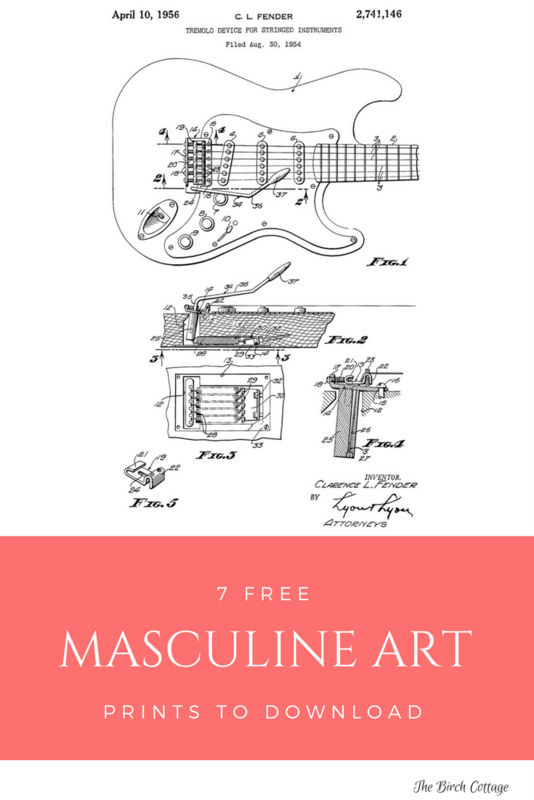 These masculine art prints are actually vintage patents. 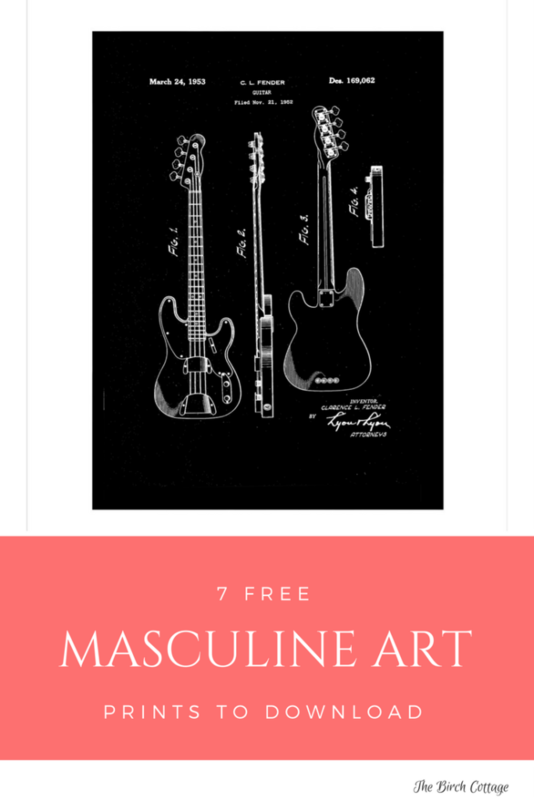 I was searching online for some ideas for artwork for our youngest son’s renovated bedroom, when it occurred to me that I haven’t shared very many masculine art prints with you. So, as of today, all of that is changing! I actually found quite a few masculine art prints online. If you follow The Birch Cottage on Facebook, you might remember the NASA Visions of the Future posters I shared with you last year. Those posters are just fantastic and perfect for anyone who has an interest or obsession with space. But, since I was focusing on looking for masculine art prints for our son’s bedroom, I was really looking for something with maybe a musical theme that wasn’t too feminine. 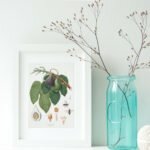 This collection of 7 free masculine art prints to download are exactly what I discovered as possibilities for our son’s bedroom. Most of the images or art prints I’m sharing with you today came from the Primer Magazine website. 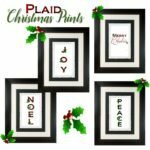 These patent prints are unique and with their black and white tones, they are perfect in just about any space and printed at any size. The Telecaster Patent print is from a Patent that was filed in April 1951 by Clarence L. Fender and issued in August 1951. 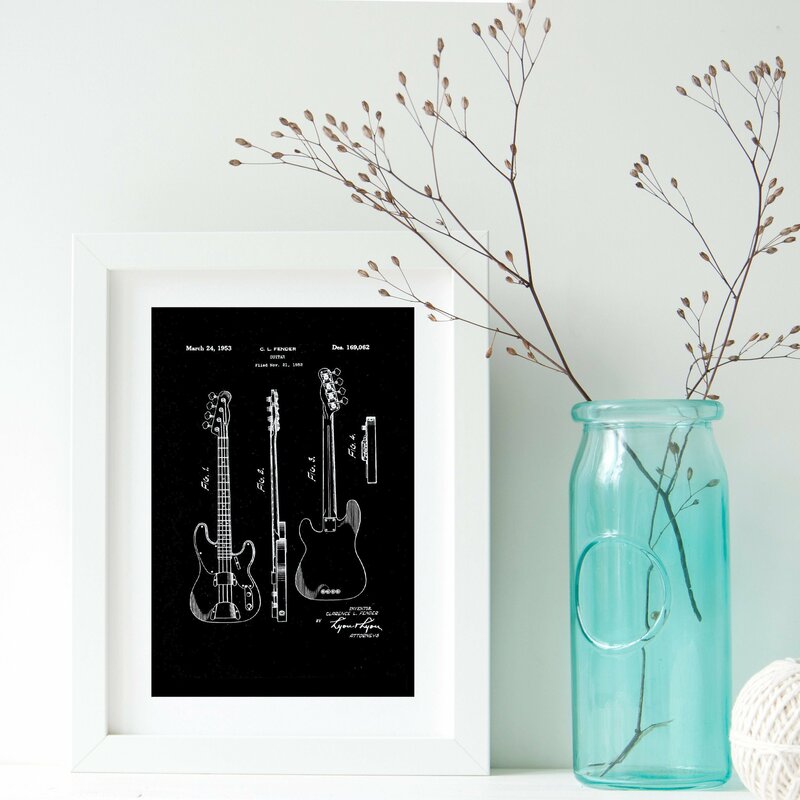 ⇒Click here to access the Telecaster Patent print. Our son is a music snob. Seriously. I can’t tell you how many different amplifiers he has owned through the years, beginning at a very young age. Like I said, he has quite the ear for music and loves good, quality sound. You can get plenty of that with a good amplifier. ⇒Click here to access the Fender Amplifier and Loud Speaker Patent print. Our youngest son is a music performance major. His instrument of choice? Tuba! He is also a phenomenal musician on the piano and guitar. Not to mention he just about has perfect pitch with his voice. He’s an extraordinary musician and I’m not just saying that because he’s my son. Although, I do wish I had half h⇒is talent. 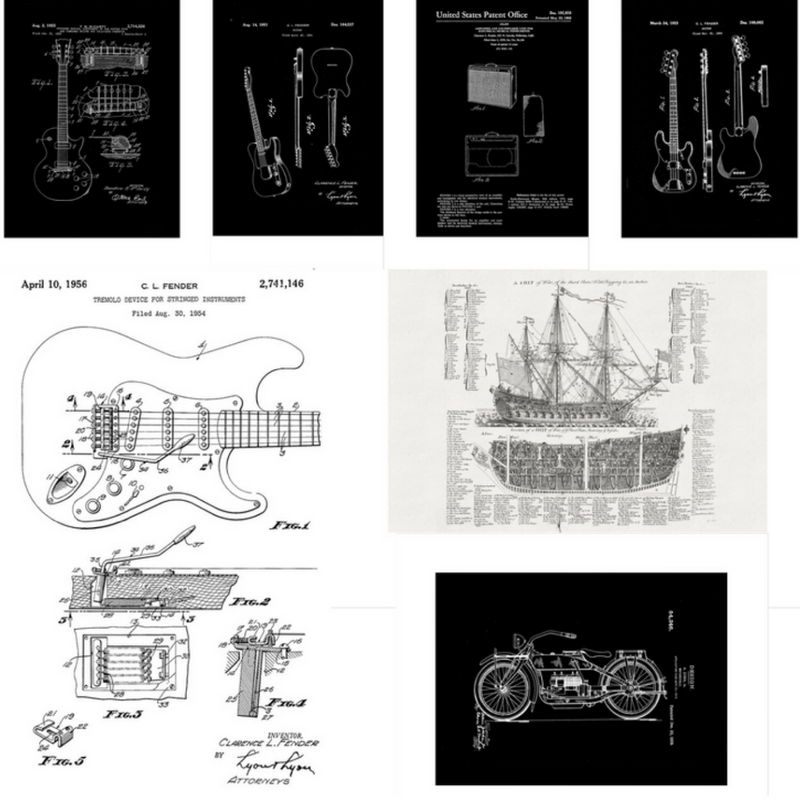 ⇒Click here to access the Fender Precision Bass Guitar Patent print. 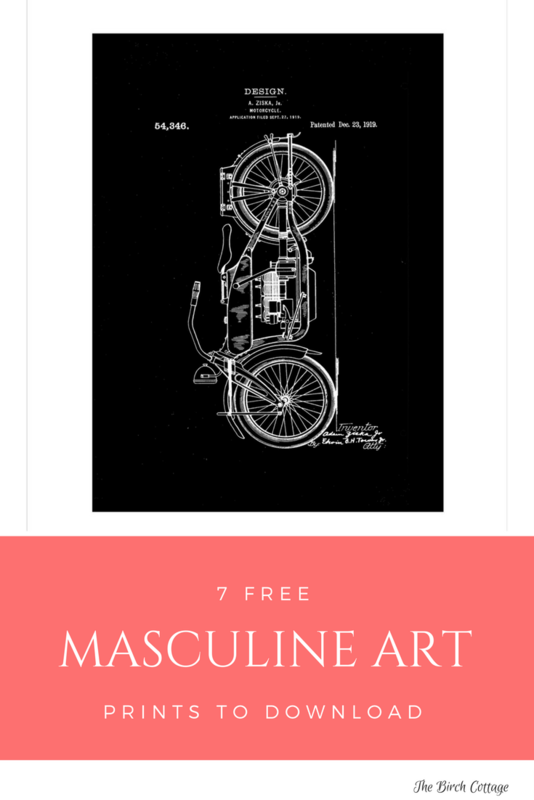 For all the men who are more in to speed, this Motorcycle Patent art print is perfect! Put it in a nice black frame and hang it wherever your heart desires. This patent was filed in September 1919 by Adam Ziska, Jr and patented in December of 1919. ⇒Click here to access the Ziska Motorcycle Patent print. This Tremolo Device Patent was another patent filed by C L Fender in August of 1954 and patented in April 1956. ⇒Click here to access the Tremolo Device for Stringed Instruments Patent print. The McCarty Guitar Patent was filed in 1953 and patented in August of 1955 by Ted McCarty. This print will certainly appeal to music lovers and I think will make a perfect addition to our son’s bedroom. 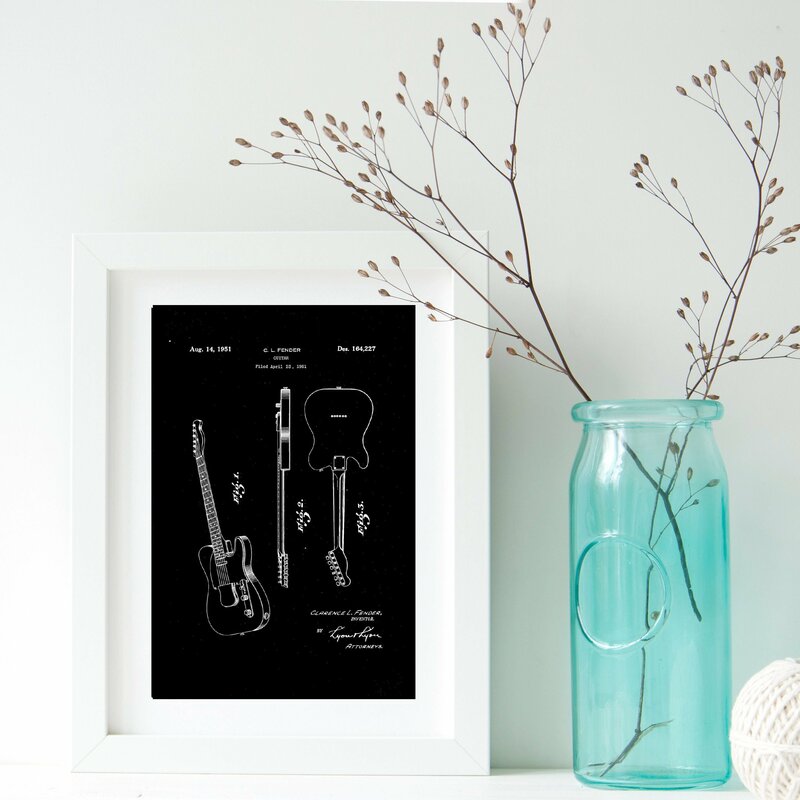 ⇒Click here to access the McCarty Guitar Patent print. For a masculine art print that isn’t music related, this Ship of Ward of the Third Rate is a fantastic piece of artwork that is not only a masculine art print, but would be perfect in a den, office or even a cottage. ⇒Click here to access the Ship of Ward of the Third Rate print. 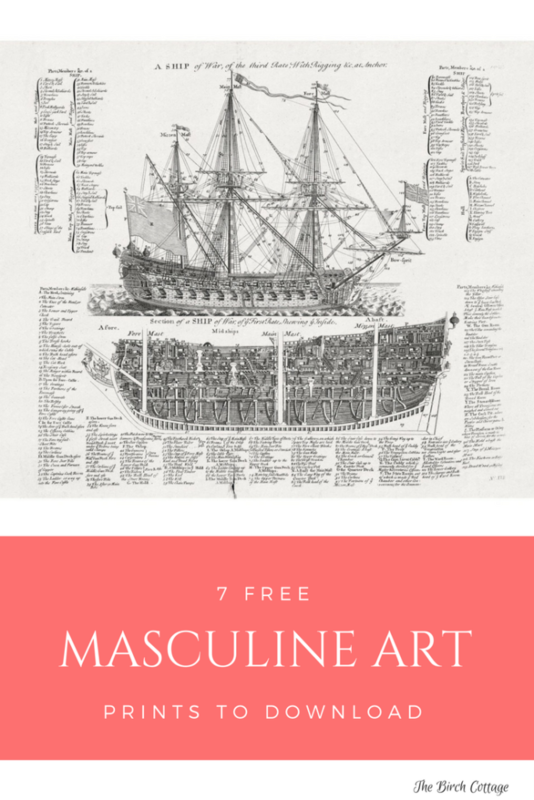 There are plenty of sources online for free masculine art prints that you can download for free and either print at home or use a print service like Staples. 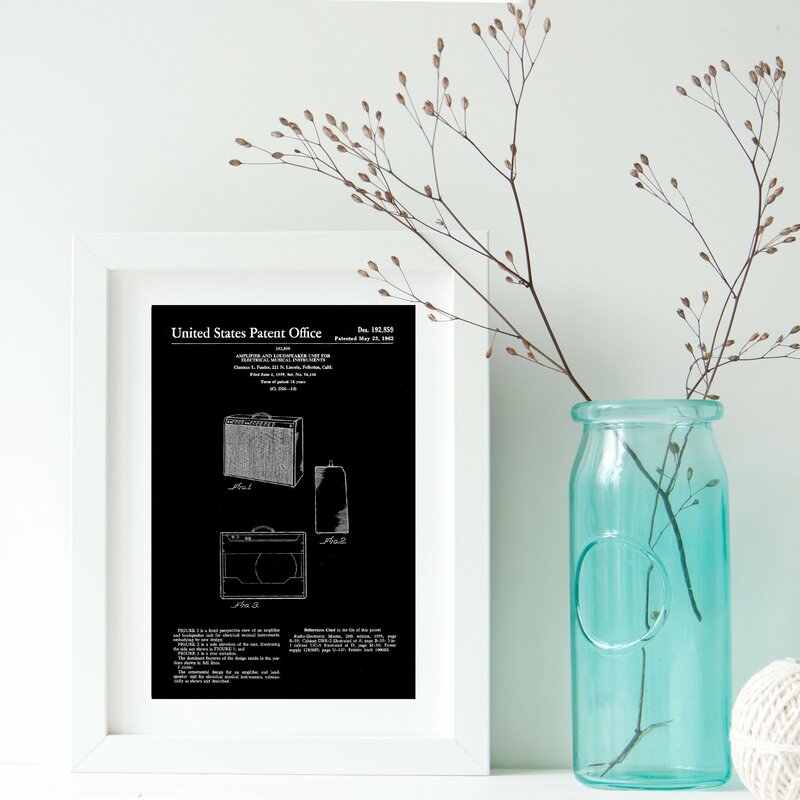 One of the easiest ways to find patent prints is by using the Google Patent Search. You might remember these NASA Visions of the Future posters/prints that I had shared with you previously. They are fantastic pieces of art prints that NASA actually made available for free download and use. There are a slew of beautiful and colorful posters to choose from. 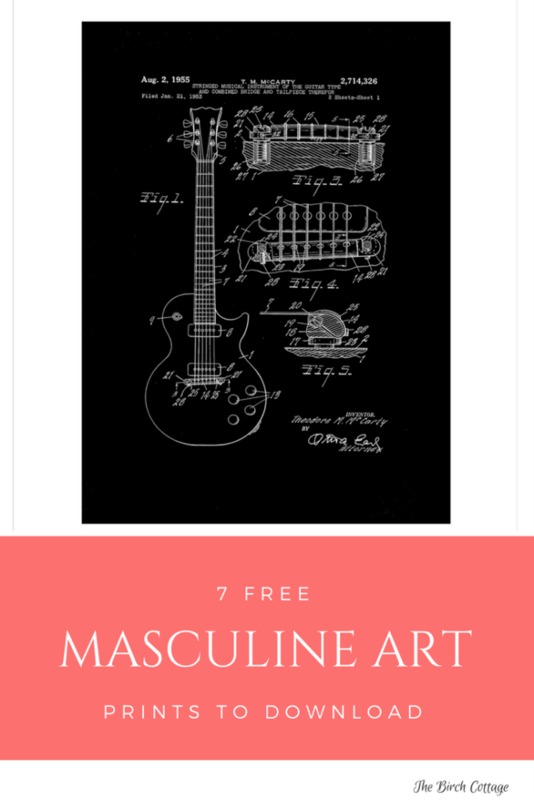 You can find more masculine art prints at the Library of Congress where you can search for pictures by topic, then download and print for free. Your options truly are limitless! 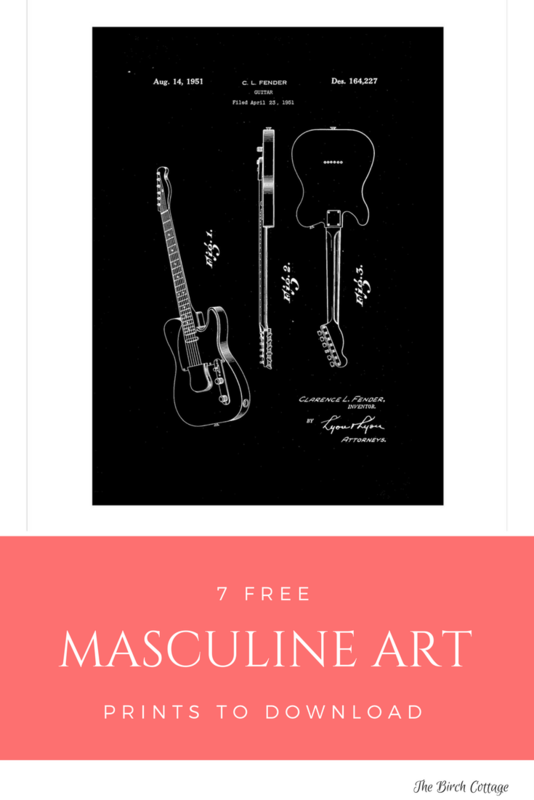 I’ll be taking I have actually already taken some of the musical themed masculine art prints to Staples and utilized their engineering prints service. Then I’m planning to frame them in some simple black frames. 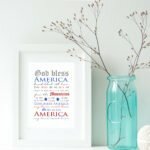 These are just the perfect finishing touch for our son’s bedroom. Did I mention he’s majoring in tuba performance in college? Just started his junior year! Now I just have to hope our son’s not reading this post or else the surprise won’t be a surprise! I also found a lot of other lovely patents that I really liked, like the typewriter patent or this camera patent. But, they don’t fit in with the theme of our son’s bedroom or even match his interests. They just so happen to match my interests (which is all that matters, right?). 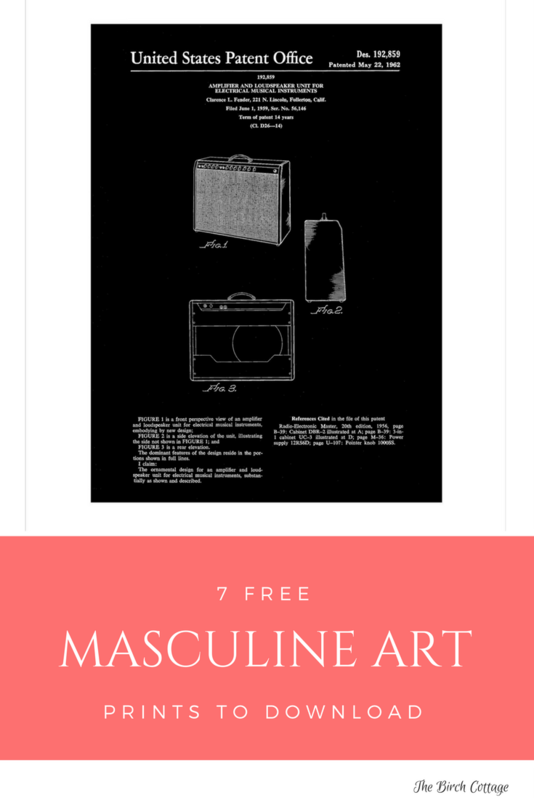 I hope you will find these masculine art prints useful to you and maybe even inspire your creativity! P.S. 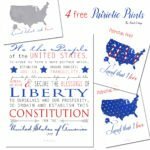 – If you’re looking for more free prints or inspiration be sure to check out the free prints right here on The Birch Cottage blog. Below is just a sampling of some of the prints available.